Get rid of writer's block once and for all. Experiment with new scales, harmonies, and melodies easily. Use Sundog to play around with chords and basenotes like a breeze. Go from calm, smooth, chill out styles to energetic upbeat tunes in a matter of seconds. Promised. Insiders' tip! Working with Sundog is a real pleasure and leads to appealing results incredibly fast. Thumbs up for the clear user interface! Every song needs a good harmonic base. Once you have the chords going, set up a bassline and added some nice background melodies you surely know whether it's going to be great - or just meeeh. Finding that song core is like digging for gold. It's a lot of work and oftentimes needlessly repetitive and annoying. Does the following sound familiar to you? You have all the instruments ready for a song, but cannot find good chord progressions. You wrote all the chords and background melodies, but now want to try different chords with the same melodic patterns. You always fall back to the same keys and scales that you already know. You know exactly how a melody / arpeggio / bassline should be structured and are annoyed by entering it note by note to match the chords. Wouldn't it be great if you could skip the stuff that holds you back to experiment more? I know for sure that this was true for me. This is why I sat down to write a software that could help me reduce the friction - and that boosted my songwriting in more ways than I thought was possible. Soo.. how can Sundog assist you? Sundog is designed to work with all major DAWs. All note output happens via MIDI. As long as you set up a virtual MIDI cable between Sundog and your DAW you are ready to go. But even without a virtual MIDI cable you can create new songs and phrases, as Sundog contains an own factory soundset with over 100 instruments. And it can export MIDI files directly to other programs. The first thing you do is choosing a scale and a basenote. 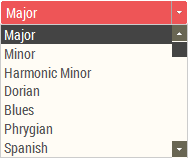 Take C Major for example if you want to compose a happy song, or E Minor if you write a sad ballad. Just choose a scale and play some notes. You will quickly get a feeling for the mood of the scale. In a second step you switch over to a special chords view. You can listen to chords by just clicking buttons - and they will all fit your chosen scale! Once you have found some nice chords you can create a chord progression. This will be the harmonic base of your song. Back in the main view the real magic starts. You can use your mouse, your MIDI keyboard, or your computer keyboard to create new melodies. All your input can either be mapped to scale notes - great for leads! - or to the current chord notes. This way your melodies will always sound harmonic! Now if you go back to the chords view and change some chords all your melodies will get updated at once. I'm about to test Sundog and think that the program is outstandig. I tested a bunch of chord- and song-tools, and for me Sundog is top class (I work with chords intuitively most of the time). Rainer S.
Just passing by to say a big thank you. I has a wonderfull evening yesterday. I didn't had so much fun since years with a music software. Benoit R.
I'm just a hobbyist with permanent lack of free time for creating music, so I hope it increase my "productivity :-). I also think that it can give me some basic knowledge about harmony. Thank you and best regards. Jacek S.
Awesome update! Love this. Matt B.
Sundog comes with an extensive manual that covers everything you need for your songwriting. And there are also quite a few videos to get you started quickly. Check them out! 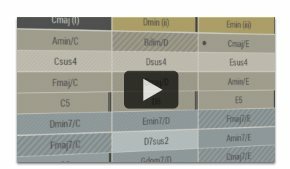 The advanced guide to the Chords View. 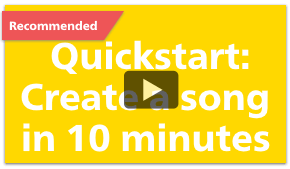 Learn the most important concepts of Sundog - and create a song in 10 minutes. Advanced Sundog and songwriting tricks. Learn more about the Pattern Trigger editor and various Sundog tricks. Find the best fitting triads and four note chords for a scale. Over 500 chord progressions + progression search engine included. Create own chord collections and trigger them with one finger. Work with chord voicings / variations. 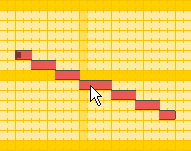 Draw melodies with your mouse or use the built-in step sequencer. 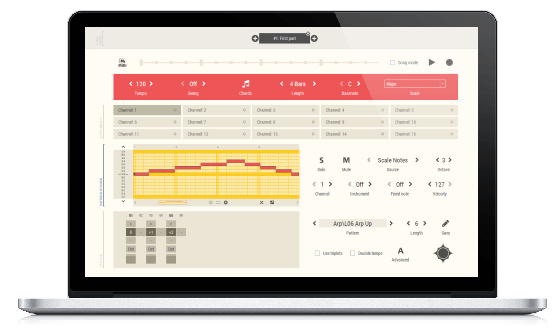 Let melodic rhythms follow your chord notes automatically. 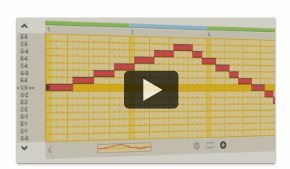 Use the Pattern Finder to search through over 200 factory rhythms/patterns. Experiment with new scales and basenotes. Over 300 scales available out of the box. Scale Finder included: Enter some notes that you already know and let Sundog search scales for you. Work with different song parts to test progressions, bridges, and variations. Cure writer's block by experimenting with new harmonies. Convert MIDI note input (white keys) to scale notes and chords. Export standard MIDI files - also via drag and drop. Ships with different dark and light themes. Try before you buy: Test the demo here.